How to Make a Harry Potter Monster Book of Monsters « Adafruit Industries – Makers, hackers, artists, designers and engineers! If you want something to compliment your Hogwarts student costume with something special, consider making a Monster Book of Monsters. It’s portable, and you can design the book with sound effects so you can surprise anyone who tries to wrangle it. Instructables user Muggle Magic goes through the steps of making the best and most dangerous school book ever with paper, polymer clay, gold and silver leaf, and other standard supplies you can find at any craft store. 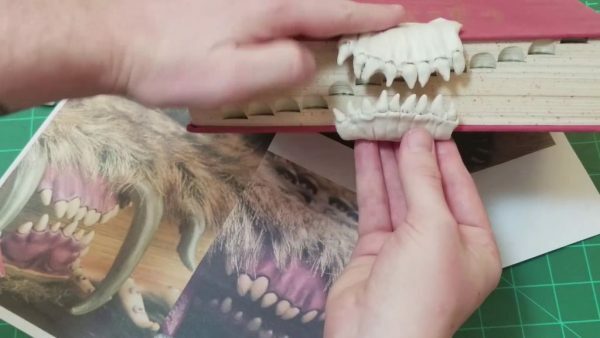 Use the polymer clay to shape the gums/teeth and tongue. I looked at several screenshots of the monster book as reference. Check out the photos and video tutorial (part 1) for more details and tips. Bake the clay in the oven according to the instructions for the clay you’re using. 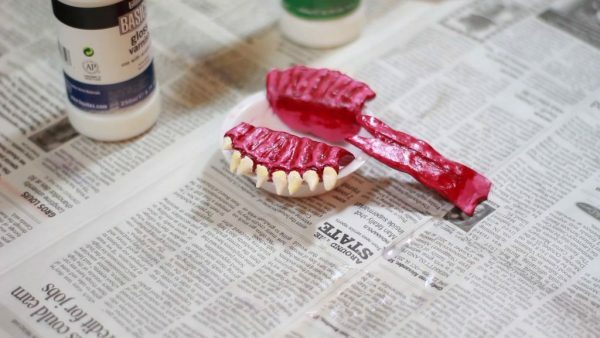 Once the pieces cooled down and fully hardened, use the acrylic paints to color them. I used an off-white color for the teeth and pink and crimson for the gums and tongue. Use screenshots of the monster book as reference as you paint. After they dry you can optionally coat the gums/teeth in matte finish and the tongue in gloss finish. Learn more and get templates at Instructables and see the rest of the video tutorials on YouTube.